The installation meeting of the Ingol Lodge of Saint Margaret No 8544 saw Gowan O’Hagan return to the master’s chair after a gap of 12 years. The principal guest of the evening was Assistant Provincial Grand Master Stewart Seddon who was accompanied by the Preston Group Vice Chairman Geoff Saul. They were supported by acting Provincial grand officers, Gordon Smith and Peter Ledder. Following the completion of the administrative business, the lodge was opened in the second degree before the DC Gowan O’Hagan, requested permission to retire from the lodge. 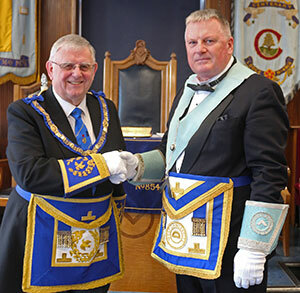 The lodge was then raised to the third degree and on Gowan’s return he to announce the presence of Assistant Provincial Grand Master Stewart Seddon, who entered in due form accompanied by grand and Provincial grand officers. He was welcomed by the master of the lodge Ellis Wilkinson. 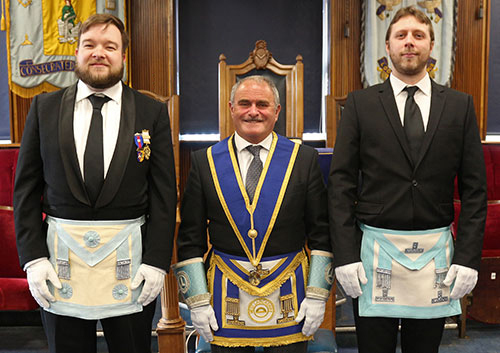 Following salutations, the lodge returned to the second degree, at which point, Ellis thanked all his officers for their support during his year in office. Steve Croasdale assumed the role of DC as Gowan was duly presented for installation by lodge member Joe Collier. After being reminded of his duties as master, Gowan recited his obligation before the lodge returned to the third degree. Ellis then proceeded to install Gowan as the next master of the lodge in a first-class manner. During the ceremony, the working tools of the third, second and first degrees were presented in an equally commendable manner by Owen Thomas, Joe Welsby and Andrew Colosimo respectively. Following his installation into the chair, Gowan was addressed by Alan Eastham, who continued the high standard set by the working tools team. Gowan’s first act as master was to appoint and invest his officers for the year. He commenced by appointing and investing Joe Welsby as the senior warden and Paul Shuttleworth as the junior warden. The address to the wardens was excellently presented by David Seed. Following the appointment of Paul McKernan as charity steward, he was addressed with regards to his duties by Vic Parker, the Preston Group Charity Steward. On his further appointment as the lodge senior deacon, Paul was addressed as to the duties of that office by Bob Cadman. Bob continued by delivering the address to the four appointed stewards of the lodge. The ceremony concluded with the address to the brethren of the lodge given by the principal guest, Stewart Seddon. Stewart then had the pleasure of bringing the congratulations and good wishes of the Provincial Grand Master Tony Harrison, commenting on the excellent way Gowan had been installed in the chair by Ellis as installing master. On Tony’s behalf, he congratulated Gowan on attaining the chair of the lodge for the third time, wishing him well for his term of office and praising the work of all the brethren who had taken part in what had been a first-class ceremony. In return, Gowan presented Stewart with four charity cheques. For the information of those present, Stewart informed everyone that the first three cheques were for the sum of £120; the first, in support of St Catherine’s Hospice, the second, in support of the Rosemere Cancer Foundation, the third, in support of Galloways Society for the Blind and the final cheque, for £48, was in support of the West Lancashire Freemasons Charity. The working tools team, from left to right: Owen Thomas, Joe Welsby and Andrew Colosimo. Later in the evening, in response to the toast to the grand officers, Stewart brought his own congratulations saying he was pleased to have the company of Geoff Saul and how much they had both enjoyed the ceremony and the work of Ellis, both in the meeting and during his year in office. He particularly mentioned master Mason, Owen Thomas and his excellent presentation of the third degree working tools. His congratulations extended to Gowan for taking the master’s chair once again. He wished him well for his year in office hoping he would have plenty of work to do in furthering the lodge. Moving on to charitable giving, on behalf of the ultimate recipients, Stewart thanked the lodge for the generous donations made earlier. He asked the brethren to be mindful of giving support to the current MCF 2021 Festival but not to completely ignore the charities the lodge normally supports. Mentioning the Festival, Stewart thanked all the brethren that had already taken out a pledge of support and encouraged them to wear their Festival Jewel with pride. To those who have yet to take out a pledge, he asked them to give it some consideration, informing them that current cost works out at about 23 pence per day. Pictured left: Ellis Wilkinson (left) concludes the master’s song with a toast to Gowan. Pictured right: Gowan (right) presents Stewart with a bouquet for his wife Val. Turning to the Royal Arch, an Order that is close to his heart, Stewart asked those who were already members to encourage those within their lodges who have yet to take that step. He felt that the enhanced exaltation ceremony added so much to the occasion that the exaltees, could not fail to be impressed. Returning to the Craft, with total membership now below 8,000, Stewart was conscious of the reduction in numbers in the Province of West Lancashire. However, he considered it important for lodges not to push their new members too hard with regards to progression through the lodge. He suggested that more past masters should consider going through the chair again. He concluded his response by thanking Geoff Saul and Peter Ledder for their support, Tristram Thorpe for his communications in his role as lodge secretary, continuing his thanks with those to the members of the lodge for their support, assistance and hospitality, saying what a thoroughly enjoyable occasion it had been. Later, as part of the festivities, a raffle was held that swelled the lodge’s charity account by £165. The proceedings were further enhanced by a delightful rendition of the master’s song given by Ellis accompanied by John Whittall on the piano. The evening was rounded off with a presentation of a bouquet of flowers to Stewart for him to pass to his wife, Val, as an appreciation from the lodge for being without Stewart’s company for another evening. Pictured from left to right, are: Peter Ledder, Stewart Seddon, Gowan O’Hagan, Ellis Wilkinson, Geoff Saul and Gordon Smith.